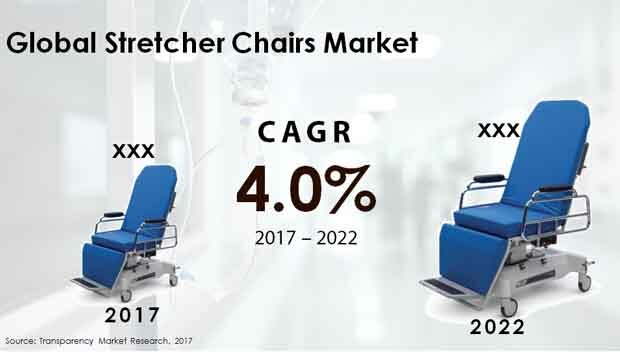 A fresh study by Transparency Market Research (TMR) has detected that the global stretcher chair market is heavily dependent on innovative products, and that a number of players are connected to its value chain, starting from raw material suppliers to the manufacturers to the end users. The TMR report identifies Allengers Medical Systems Limited, AMTAI Medical Equipment, Inc., Blue Chip Medical Products, Inc., CDR Systems, C-RAD AB, Elekta AB, Getinge AB, GF Health Products, Inc., Hill-Rom Holdings, Inc., Invacare Corp, Leoni AG, medifa-hesse GmbH & CoKG, Medtronic Plc., Novak M d.o.o, OPT SurgiSystems S.R.L., Skytron llc., Span America Medical System, Inc., STERIS, Stryker Corporation, and Transmotion Medical, Inc. as some of the key companies currently operating in the global stretcher chair market. As per the projections of the TMR report, the demand in the global stretcher chair market will increment at a CAGR of 4.0% during the forecast period of 2017 to 2022. The report has evaluated that the stretcher chair market, across the globe, had an opportunity worth US$204.6 mn in 2017, which will reach a valuation of US$248.5 mn by 2022. In the near future, the prominent companies are expected to indulge in strategic collaborations with local players in order to increase their geographical presence and gain ground over the competitors. On the basis of product type, the TMR report rates general stretcher chair as the leading segment of the global stretcher chair market, yielding 62.6% of the overall demand in 2017, which was worth US$128.1 mn. This segment is projected remain most profitable and account for 60.8% of the total demand in the market for stretcher chair by the end of 2022, serving revenue of US$151.0 mn. Geographically, the developed regions of Europe and North America currently serve maximum demand for stretcher chair, although Europe is expected to lose its leading position to North America, which has been estimated for an above-average CAGR of 4.2% during the forecast period of 2017 to 2022. Recent improvements to the product has been the most prominent driver of the global stretcher chair market. Now, stretcher chair are available that are designed specifically to carry patients in places such as corridors, stairs, and lifts, are easy to clean and lightweight as they are now made of aluminum alloy framework, and offer flexibility and fold-ability. Modern stretcher chairs now also come with safety belts for elderly patients and help majorly in transportation. As the awareness regarding the availability of these advanced products increases, the demand in the global stretcher chair market is expected to escalate. The stretcher chair market is also gaining strong traction from the late but eventual penetration of ecommerce in the region of Asia Pacific. This is a vastly populated region, and the disposable income is increasing among the urban population. The consumers can now research their product and read the reviews as well as guidelines of usage before making the purchase. Mushrooming number of specialty clinics, increased number of accidents across the world, and escalating percentage of geriatric population who frequently suffer from illness that hinders their movability are some of the other factors augmenting the demand in the global stretcher chair market. While the high cost of these continues to obstruct the market for stretcher chair to meet its potential in the emerging economies, the companies are working on setting up localized manufacturing units in order to reduce production cost and meet the consumers at a reasonable price.